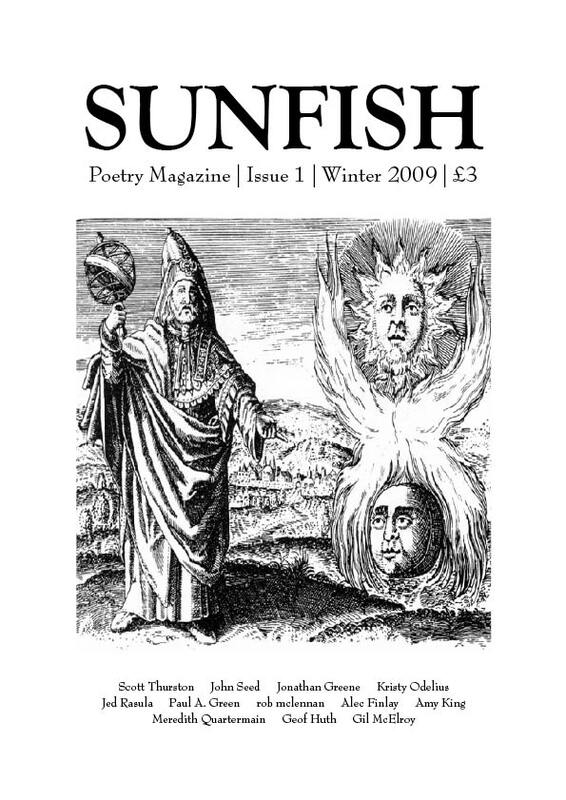 Sunfish is a new quarterly poetry magazine edited by Nigel Wood and published in Manchester. Issue 1 contains work by Scott Thurston (UK), Jed Rasula (USA), John Seed (UK), Kristy Odelius (USA), Jonathan Greene (USA), rob mclennan (Canada), Geof Huth (USA), Paul A. Green (UK), Meredith Quartermain (Canada), Amy King (USA), Gil McElroy (Canada) and Alec Finlay (UK). It’s just in from the printer and costs £3 (+50p postage). A Sunfish website is in the pipeline; in the meantime, you can get hold of a copy by sending a cheque for £3.50 (made out to Nigel Wood) to: Flat 405, 41 Old Birley Street, Hulme, Manchester M15 5RE. If you’re in Manchester you can save yourself the postage by picking up a copy at the next Other Room reading on December 2nd. For more information, email sunfishmag@googlemail.com.